This is a guest post by two educationalists, Dr. Beatrice J. V. Balfour and Dr. Alejandra Manena Vilanova, who describe their experience of co-designing a government school in Ecuador. We respond to the question of our title – how to make a basic school design pedagogically interesting – by reflecting on our experiences of creating a public school in Javier Loyola, a relatively rural area of Ecuador close to the city of Cuenca. The ‘Unidad Educativa – UNAE’ will open in September 2018 to approximately 300 students (preschoolers to elementary students) and will reach full capacity in a few years, for a total of 2,000 students between 2-18 years. In this post, we want to discuss the value of architects working with educationalists and vice-versa. Architecture is often positioned as secondary to education with schools being “made” only by the people that work in, and inhabit, the structures (see Vecchi, 2010). We believe instead that without the work of, and collaboration between, educationalists and architects, it is difficult to achieve high-quality education. The Correa Government (2007-17) promoted investment in education and the creation of many new schools (including this one). This school is also part of the Universidad Nacional de Educación (Ecuador’s largest teacher training institution) project to create a model school that could host, support and exemplify new forms of teaching and learning. We received a very basic school project and structure from the Ministry of Education, and our mission was to develop the school and its design: key to our pedagogical vision was that the school environments would be ‘actors’ in teaching and educating students by sparking and provoking students’ learning. The Ministry of Education’s initial plan could not afford such pedagogies with a basic and rigid prefabricated structure revealing small classrooms and few collective work areas (for students as well as teachers). To resolve these early challenges, we assembled a multi-disciplinary team to change the original school plans. This team included ourselves (both educationalists trained in progressive pedagogies), established artists and scientists who were also professors or members of the Board of Directors of the University, and architects from the University. However, we also needed an architect who could draw on a range of approaches to inspire our pedagogical model through design and Sebastiano Longaretti, who was specialised in building schools and who had developed many Reggio Emilia-inspired schools around the world, took on this role. Sebastiano started to collaborate with Pauline Avilez Parra (our architect in the University) and the rest of our team. Revising the original plans meant planning new structures: for example, there was no art space in the original brief and, for us, art and creativity are key to learning and teaching and so an ‘Atelier’ – or art studio – became part of the school. Figure 1 shows the original plan of the school with some notes that we added during early meetings. The small white rectangle at the top indicates where we originally thought of placing the Atelier, or art studio. The other two large white rectangles were the school’s sports fields. We wanted to break the rigidity of the structure by changing the function of these fields and their appearance, but we were not quite sure how to do so yet. In this preliminary phase, we imagined drawing some murals on the floor of the field inspired by indigenous mythology. These murals would help to break the rigid lines of the soccer fields, making them multi-functional spaces for a range of sports and activities. With Sebastiano’s help, we decided to place a welcome square at the top where the rectangle is (and where originally we thought of placing the Atelier). The Atelier would move to replace one of the soccer fields (bottom right, circled). We needed more space and in that position the Atelier would have a central position in the school design, in line with our pedagogical vision. Compared with the earlier image, Figure 3 shows a much more developed Atelier (the oval-like structure, bottom right), moving from just an idea to an architectonic plan. In addition, the original windows were small and would allow only a very little light into the classrooms so we opened these up by turning the windows into glass doors and adding porticos that would connect inside and outside spaces. 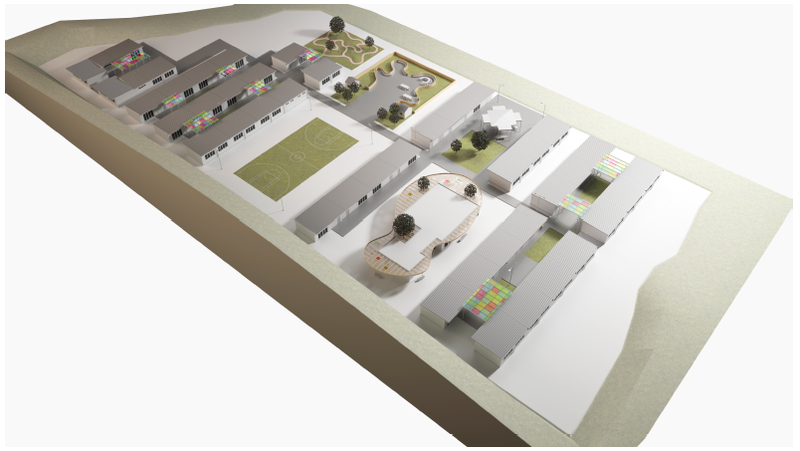 This would also increase the area of the classrooms, improve the visibility and help the development of relationships and connections between spaces and people in the school. We also made some ‘soft’ changes to the original school structure through revising the interior design organisation of space. For example, there were no collective areas for teachers in the original plan and so we reorganised the classrooms and furniture to carve out some offices and shared spaces. We specified furniture that could create some areas to store materials and projects (key in project-based learning) and eliminated teachers’ desks in every classroom, from preschool to high-school, in order to encourage less hierarchical, traditional teaching practices. It was pedagogy – our visions of teaching and learning – that drove architecture. Architects are often asked to design schools without the pedagogical plan being in place but here was the reverse – Sebastiano kept telling us that one of the things that helped him most in drawing the plans of the school was having the pedagogical plans of the school before starting. Our team had written the plans in consultation with a wider group from the university. The result was a 200-page document describing the pedagogies, how time would be organised, and descriptions of how we needed the space to enable the kind of teaching and learning we envisaged. The pedagogical plan also organised classrooms by curriculum and their different spatial requirements: art classrooms needed a space for theatre and dance whilst science rooms utilised a ‘makerspace’ where children could learn and explore science through doing. This level of detail helped the architect’s planning, but also allowed us (with the architect) to develop the environment that could incite the teaching and learning we were seeking. Teachers across Ecuador have visited the University to learn about the pedagogical model developed for the school. We hope that education will be increasingly recognised as a complex system where people and spaces, architecture and pedagogy, are understood as constantly interacting. We see the space of the school as fluid, flexible and subject to change, and architecture (understood as both the interior design of the school and the more structural aspects of the school building) as constantly informed and affected by the pedagogy; in turn we see the pedagogy as constantly shifting and inspired by architectonic decisions. Our pedagogical and architectonic plans might continue to vary as we move on to build and live the school, as well as in our encounters with other educators, with students, artists, scientists, philosophers, indigenous leaders, historians, and others. In this process, we hope people from Ecuador and elsewhere come and visit the school once it opens! Acknowledgements: With thanks to Alejandra Bueno, Arq. Ana Llerena, Professor Ángel Pérez, Esthela Durán, Emeritus Professor Helen Quinn, Lucia Torres, Jo-Anna Abad, Arq. Paulina Aviles Parra, Eng. Patricio Ortiz, and Arq. Sebastiano Longaretti.